Use our Cirque Du Soleil KA offers and you’ll save $30-$36 on individual tickets or up to $56 per ticket when you buy packs of four. Those 4-packs are truly a great deal for one of the most dazzling shows you will ever see! Click on your friend Coupon Puppet below to start saving on KA. I hope you guys are ready, because Coupon Puppet is about to drop some major math on ya’ll. If an unfortunate individual were to buy tickets for Cirque Du Soleil KA directly from MGM, a $13.95 Service Fee is added to each ticket! This makes their already high ticket prices much higher. But if you use Coupon Puppet’s Cirque Du Soleil KA offers from Best Of Vegas, there are no hidden service fees. Our biggest discounts for this show are in Price Categories B and C. If you are buying individual tickets, you can save $30 to $36 per ticket. But if you buy a 4-pack of tickets in Category B or C, you can save up to $56 per ticket! Coupon Puppet included tax in those figures, don’t worry. SUCH A GREAT DEAL. As for the show itself, KA is nothing short of remarkable. It’s the story of two twins who…never mind. Who cares what the story is, when there are acrobats and pyrotechnics and puppets and hand to hand combat. And get this! To the naked eye, there is no real stage. Just a big, black void where scenery and objects, including a sinking ship, appear and disappear! There is no use in trying to figure out how they do it, as this is the most technically advanced show in the world. They are geniuses. KA plays in the KA Theater at the MGM Grand Saturday through Wednesday, with 7:00PM and 9:30PM showtimes most nights. Please be advised, MGM charges for parking now. 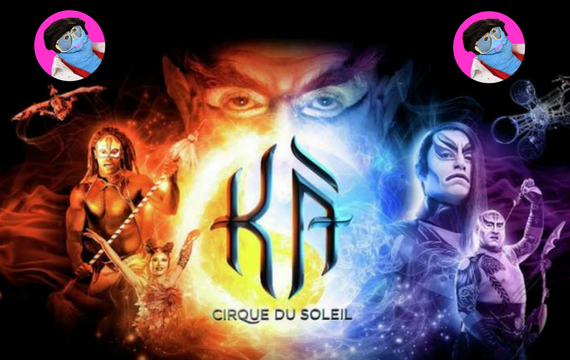 Coupon Puppet Loves Saving You Money With Cirque Du Soleil KA Offers!